The Lord counted Abram’s faith as righteousness, not any deed he had done and Paul argues that this was the case under the OT and likewise now that Christ has been raised. It is important for us to note the concept of imputed/credited righteousness in Romans 4 and elsewhere. The Greek word used in these instances is verb λογίζομαι (logizomai, G3049), which means "to reckon, count, compute, calculate, count over". Dr. William D. Mounce says that the "basic meaning of logizomai has to do with counting or thinking". The important distinction between the Protestant and Roman Catholic doctrine of justification has to do with the fact that the Protestant doctrine of justification declares the sinner to be righteous although he is not fully righteous, because of Christ's merits. While the Roman Catholic doctrine seeks to make the sinner righteous and only then will he be really justified and righteous. But notice that the word which the Apostle Paul uses, logizomai, has to do with counting and thinking of someone as righteous instead of making them righteous (e.g. Rom. 4:3, 4, 5, 6, 8, 9, 10, 11). The same is true of the word for justification, δικαιόω (dikaioo, G1344). The word is defined by Thayer as "to render righteous or such he ought to be" and "to declare, pronounce, one to be just, righteous, or such as he ought to be". Mounce gives it the basic definition of "to declare righteous, justify". Again we notice in these definitions that the idea is absent of making someone righteous and just through infusion or change of nature. Paul uses this word a lot in his epistles. It is also used Romans 4, which we were looking at. For example, Romans 4:5 says that "the one who does not work but believes in him who justifies the ungodly, his faith is counted as righteousness". Because of faith, which counted (logizomai) as righteousness, the Lord God King of the Universe, declares righteous those who have put their faith in Christ. This is not because they are practically righteous, for God is justifying the ungodly. But because of the perfect righteousness of Christ which was imputed to their account whereby God credits to them and thinks of them as righteous because they are united to Christ, the perfectly righteous Man. In further support for our point that dikaioo means declaring and counting one righteous, rather than making we call upon Luke 7:29. There, the text literally says that the people "justified God" (KJV). Now, what does this mean? Does anyone think that the people made God to be righteous? Absolutely not! Rather, as the ESV renders the passage, "they declared God just". The Judge of the Universe, because of the atoning death of His Beloved Son on our behalf, declares us to be righteous. Our union with Christ makes it so that His death becomes our death, His resurrection our resurrection, His life our life, His righteousness our righteousness. Although we have not yet been perfectly conformed to His image, we are certainly predestined to that end (Rom. 8:29). In other words, God will make us righteous, but this is not what the New Testament speaks about for our salvation. Rather, this is sanctification in which the Holy Spirit works to change us into Christ's image, but it is a life-long process of ups and downs (see here). This is a controversial point, especially with Arminians and other non-Calvinists. Calvinists have always insisted that faith is a gift from God given to us and does not have its origin in us or our wills. We don’t believe that God believes for us, but we believe that it is God who works faith in our heart and changes our nature so that we are made able to exercise faith in Christ. God gives us faith and we believe. Faith does not originate with us. It is a divine work which lasts until we see Him in heaven. Unless this work of grace takes place, Scripture teaches us that we are both unable and unwilling to come to Christ (see chapter 6). Let’s take a look at a few passages which Calvinists have used to support the idea that faith is a gift and to see whether this is indeed biblical. The case for regeneration preceding faith rests upon the first part of the verse that I highlighted and the use of the verb tenses there. Notice that in the YLT we can see the tenses much clearer than in other normal English translations, although the verse reads a little bit strange than usual English. The people who are believing, it is a present act of believing. It is something that is happening now, it is an active and present faith, not one which is in the past. But, this faith was the result of an action in the past. Now we come to the crucial point. The verb γεγέννηται (gegennetai, G1080), which has been translated with “has been born” in the ESV and “he hath been begotten” in the YTL is a perfect passive indicative in Greek. What does that all mean? Don't worry, we'll take a look at every aspect. The verb tense used by the writer to describe a completed verbal action that occurred in the past but which produced a state of being or a result that exists in the present (in relation to the writer). The emphasis of the perfect is not the past action so much as it is as such but the present “state of affairs” resulting from the past action. The point which I am trying to get across is that the “believes that Jesus is the Christ” is in the present active tense and according to the perfect passive indicative comes as the result of “has been born of God”. The fact that we believe in the present is indicative that we have been born again in the past. They are connected. The present believing is dependent upon a passive action in the past, namely, that God caused us to be born again. The one precedes the other. The being born of God, which is regeneration, precedes the believing that Jesus is the Christ. Thus, this text explicitly teaches that faith does not precede regeneration, but in fact, faith is a result of regeneration. That this is, in fact, the case we look at a couple more similar constructions in John lest people accuse us of using difficult Greek stuff to confound them. In the following examples, it will be very clear to English readers how the construction works. 1 John 2:29 If you know that he is righteous, you may be sure that everyone who practices righteousness has been born of him. ποιῶν (poion, G4160, to make or do), like πιστεύων (pisteun, G4100, to have faith) is a present active participle. We find the same perfect passive indicative γεγέννηται (gegenetai, G1080) here again. It is orthodox and faithful to Scripture to say that the fact that we were born from God was the cause of us doing righteousness (e.g. Eph. 2:8-10; Titus 2:11-14). We do righteousness at the present only because in the past we were born of God. To say anything else is making salvation to be by works and not grace, thus a denial of the Gospel. The reason why we do righteousness is that we were born of God and we desire to please God (Ezk. 36:25-27). We do not do righteousness to be born of God. That is works-salvation and that is another gospel! ἀγαπῶν (agapon, G25) is again like in the two other passages, present active participle and γεγέννηται (gegenetai, G1080) is perfect passive indicative. The reason that we love is because we were born of God. We do not become regenerate because we love. It is the opposite. See among many other places about love in John's letter 1 John 4:8-12. Love is the effect, not the cause of regeneration. Now we come back 1 John 5:1. I believe that we have successfully argued from the similar use of the Greek construction in other passages by John that the “born of God” precedes and results in that one “believes that Jesus is the Christ”. 1 John 5:1 is definite and explicit upon the teaching that regeneration precedes faith. See Dr. James White, 1John 5:1, We are Born Again Then We Believe and 1 John 5:1, Regeneration, Faith, and Tradition Driven Eisegesis. In regeneration, the Sovereign and gracious Spirit of the Almighty gives us a new heart and a new spirit, in a word he makes us new. We become new creations, no longer hostile to God, but now desire the things of God. Our nature is changed. We are made spiritually alive and thus will love the things of God and will believe in God. We are no longer, in the words of 1 Corinthians 2:14, natural people, but spiritual people–indwelt and led by the Spirit of God (1Cor. 2:11-13, 15). Our situation prior to regeneration and faith is similar to that of Lazarus. He was stinking in the grave for 4 days. He had no power to raise himself up from the grave. He did not take the first step nor the last step, or any step in between. He was wholly passive through the whole process of him being made alive again. The Lord of glory, the Giver of life Himself raised him up. There was absolutely no choice of his involved in all of this. When the Lord said, “Lazarus, come out!” (John 11:43) He could do not do anything but come out. The Lord imparted life to him without asking his permission or without anything to do with his will, exactly because Lazarus was unable. So it is likewise our condition in our spiritual deadness and slavery to sin. We are not sick in sin, but dead. We are not half dead, but totally dead to the things of God. It does not mean that we do not do anything, but everything we do in our unregenerate state is sin and leads to death. We cannot do anything good or spiritual as that is not in accords with our fallen and sinful nature. The Lord Christ compares regeneration to spiritual resurrection in John 5:24-26. Rom 4:5-10 And to the one who does not work but believes in him who justifies the ungodly, his faith is counted as righteousness, 6 just as David also speaks of the blessing of the one to whom God counts righteousness apart from works: 7 “Blessed are those whose lawless deeds are forgiven, and whose sins are covered; 8 blessed is the man against whom the Lord will not count his sin.” 9 Is this blessing then only for the circumcised, or also for the uncircumcised? For we say that faith was counted to Abraham as righteousness. 10 How then was it counted to him? Was it before or after he had been circumcised? It was not after, but before he was circumcised. It is our faith which is counted by God as if it was our righteousness. Our faith is in Christ. Under the Old Testament, it was in the promises of God and the types and shadows as they did not have the complete revelation of God yet. But Paul says that even David speaks of justification by faith alone. It is our faith which is the lone instrument of this. God counts our belief, trust, confidence, and faith in Him as our righteousness just like He did for Abraham (Gen. 15:6). This was as Paul, again and again, says—apart from works. Works were not into consideration because all of them are as filthy rags (Isa. 64:6) and no really does anything “good” before a perfectly holy God (Rom. 3:10, 12). Even the father of the faithful, says Paul in verse 10, was justified by faith, how much more his children. But to stress his point, even more, he refers back to the Genesis 15 episode where God makes the covenant with Abraham. The circumcision part had not come yet, it is established in Genesis 17, but Genesis 15:6 says that God counted Abraham’s faith in God and trust in His promises as the ground of Abraham’s right-standing before Him. God did not declare Abraham just after he was circumcised, but before he was circumcised. He was justified by faith alone apart from works. We could go on and on, but it is needless. 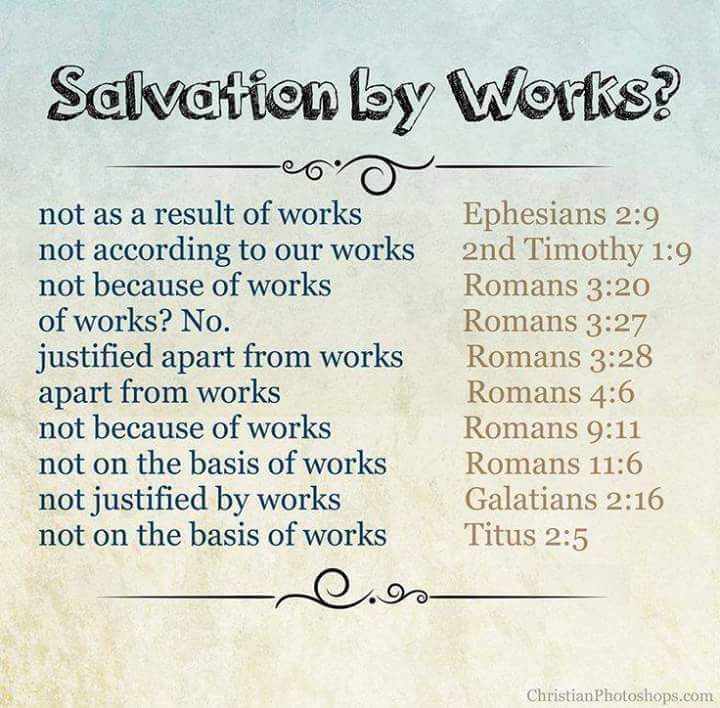 I believe that those verses sufficiently show that works are excluded from salvation. See CARM for more: “Are we saved by faith alone, or do we need works, too?” and “Verses Showing Justification by Faith”. Usually, the Roman Catholic would object to the case made above and go to James 2:24 where it is stated that “a person is justified by works and not by faith alone.” What is the context and what is James trying to communicate here? Does he say that we must work for our salvation? I do not believe so, otherwise, that would make the Bible contradictory with itself and that is something which both positions do not believe. Let’s take a look. It is necessary to begin our discussion from verse 14 and not to jump into v. 24 with no consideration of what the context is and what came before. Is he saying that we are justified by works and faith before God or something else? Jas. 2:14-17 What good is it, my brothers, if someone says he has faith but does not have works? Can that faith save him? 15 If a brother or sister is poorly clothed and lacking in daily food, 16 and one of you says to them, “Go in peace, be warmed and filled,” without giving them the things needed for the body, what good is that? 17 So also faith by itself, if it does not have works, is dead. You see, the discussion should not begin at v. 24 if you want to get the correct and consistent understanding of the passage but begin at v. 14 or even 1:1 to get the whole context. But it is sufficient and good if we begin here. James starts by asserting what does it matter if one merely says he has faith. “If someone says” that they’re Christian, but do not bear “fruit in keeping with repentance” (Matt. 3:8), their faith is empty. They are merely saying that their Christians, but in fact do not give any evidence that they are followers of Christ. Furthermore, James points back to the fruitless faith of that person saying, "Can that faith save him?” The question, therefore, is not can faith alone save, but it is can a fruitless faith save? You see, the whole discussion should be framed in regards to this point that James is trying to refute the idea that because “someone [merely] says” that they’re justified and have faith, means that they're justified. Saying that one is justified and a believer, does not, in fact, mean that they are truly justified and are true believers. That is what is James combating here. Galatians 6:10 encourages us to do good and help people, especially our brothers and sisters in Christ. Paul is clear on justification by faith alone, yet the faith that justifies always works out in love. Now notice what is said in James 2:15-16, those who claim that they have faith, do not, in fact, obey Paul’s exhortation to do good, especially to their brothers and sisters in the Lord and therefore they do not give any evidence that saving faith resides within them. Their entire “faith” is merely their assertion that they have faith with no evidence. On this basis, James says in verse 17 that if this is what you think faith is, i.e., merely the assertion of faith without the accompanying fruit, then that “faith” that you actually have is dead, false and fake. It is useless; it is not going to help you. It is not saving faith. We keep our faith alive through acting out on our faith and bearing the fruit that comes from the fact that the Spirit is within us. We want to do good works so that our Father would be glorified (Matt. 5:16). We want to do the good works, which the God who saved us by grace and through faith, had prepared for us from eternity (Eph. 2:10). Jas. 2:18-19 But someone will say, “You have faith and I have works.” Show me your faith apart from your works, and I will show you my faith by my works. 19 You believe that God is one; you do well. Even the demons believe—and shudder! Again, we continue with what we established before, the mere claim of possession of faith and the actual possession of faith. We are justified by the possession of faith, not by the mere profession of faith. Faith is something that is internal between oneself and God, it is not something invisible to others. But there is a way in which true faith can be seen, namely, by our deeds to the glory of God. God knows if we have true and saving faith because He knows everything and knows us better than ourselves, but people cannot know if we have true saving faith. The only way for them to have an idea if we have faith is to observe our walk of life and our deeds. That’s the reason that James says that it is impossible to demonstrate your faith before people without your works, i.e., the fruits of your repentance and faith (Matt. 3:8; Acts 26:20). The context of James’ discussion is not justification before God, rather the discussion is the demonstration of your justification and faith before people. James is not concerned here with what dwells inside a believer, but his discussion concerns those who profess the faith but do not act like it. It is those people who cannot demonstrate their justification before men. Jas. 2:20-26 Do you want to be shown, you foolish person, that faith apart from works is useless? 21 Was not Abraham our father justified by works when he offered up his son Isaac on the altar? 22 You see that faith was active along with his works, and faith was completed by his works; 23 and the Scripture was fulfilled that says, “Abraham believed God, and it was counted to him as righteousness”—and he was called a friend of God. 24 You see that a person is justified by works and not by faith alone. 25 And in the same way was not also Rahab the prostitute justified by works when she received the messengers and sent them out by another way? 26 For as the body apart from the spirit is dead, so also faith apart from works is dead. The discussion continues. The profession of the faith is useless without works by which you can demonstrate the genuineness of your faith. Now we get to the justification of Abraham. Paul has clearly argued in Romans 4 that Abraham was justified by faith apart from works (see above). But what is James speaking about here? We have already argued that the discussion of James concerns the demonstration of our faith before people. It is not about whether we have saving faith or not before God. God knows our hearts and knows if we have true faith, people don’t the way they can see that is through our fruit (Luke 6:44). In v. 22, James argues that when Abraham offered Isaac his faith was completed by his works, i.e., the obedience to God even at this point. His faith was active and in fact, it was Hebrews says what inspired him to do what he did (Heb. 11:17-19). His faith was the driving force of his obedience. We have already argued as the Paul does himself, a better interpreter than me, that Abraham was justified by faith apart from works in Romans 4. But what James is saying here is that Abraham’s possession of true saving faith was demonstrated by his obedience to God. In this, he demonstrated that he truly believed God in everything that he said and that he would have even given his son for God. He demonstrated before all that he truly possessed true faith and not merely professed it. In v. 23 James says that the Scripture was fulfilled, it came practically to life. Abraham, by his obedience to God’s command, demonstrated to all that he possessed true saving faith in God Almighty and did not withhold his beloved son. Then the statement in v. 24 we should be understood in the light of the previous discussion. Indeed, we are not justified before men merely by faith, but by works also. 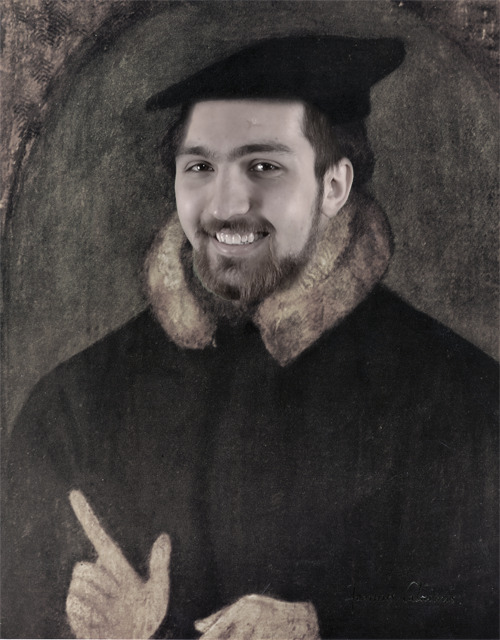 The second definition for δικαιόω (dikaioo) given by Thayer’s Greek Definitions (G1344) is “to show, exhibit, evince, one to be righteous, such as he is and wishes himself to be considered.” Abraham did show himself as righteous and justified before people by his obedience to God. He demonstrated that he possessed saving faith. In the same way as Abraham, the example of Rahab when she received and helped the Israelite spies because of the LORD’s fame which had reached Jericho. So, James concludes that just as the human body without the spirit lies in the dust and returns to dust, the same way faith without works is dead and useless. It is not saving and true faith. Saving and true faith always works itself out in love and good works (e.g. Eph. 2:8-10; Phil. 2:11-12; Titus 2:11-14; Heb. 13:20-21). What we must understand from this discussion is the fact that we are saved by faith alone, but saving faith is never alone. It is always accompanied by the fruits which are the effects of faith. Again and again we read in the New Testament of doing good works without any contradiction to the doctrine of justification by faith alone (1John 3:8; Gal. 5:13; Jas. 2:14-15; 1Pet. 1:22; 2:12; 3:1, 16; 1Tim. 2:10-11; 5:9-10; 6:17-18; Titus 2:7-8, 13-14; 3:7-8, 14; Heb. 10:24). A faith that is a true and saving faith always works itself out in works (Titus 3:7-8). How did Christ fully discharge the debt of all those that are justified? By His obedience and death (Rom. 5:8-10, 18-19). This is again a reference to His active and passive obedience (chapter 8:5). By the sacrifice of Himself, He underwent in their stead the penalty due unto them (Gal. 3:13; Isa. 53:4-6, 10). This He did so that He would make a proper, real, and full satisfaction to God's justice on their behalf. God does not simply forget or ignore our sins. His justice demands that payment be made for our wrongdoing. This God has accomplished in Jesus Christ Who paid our debt and underwent the punishment which we deserved. Both His obedience and satisfaction (i..e, active and passive obedience) are accepted in their stead. The active and passive obedience of Christ is the ground of our justification and peace with God. Both the active and passive obedience of Christ are credited to us freely, not for anything in them. This shows us absolutely that our justification is only of free grace. Prior to justification God would see our “good works” as filthy rags (Isa. 64:6) and would see that we do not desire Him (Rom. 3:9; 8:7-8). Therefore, there is nothing that would move Him to declare us righteous for anything in us. We were not righteous. But if it only of free grace then the reason for why we are justified does not lie with us, but with Him alone. God is glorified in the justification of sinners both in His exact justice as well as His rich grace (Rom. 3:26). He exacted justice upon Christ and thereby showed that He cares about His law, His glory, His holiness, and His justice. And through His justice and punishment of Christ, He lavished upon us the richness of His mercy and grace. We are freely justified by His grace, but His grace was not free. The cost of grace was the blood of Jesus Christ. Active Obedience refers to Christ's perfect obedience to the Law on our behalf and the Passive Obedience refers to the atonement on our behalf. The interested reader is referred to chapter 8 for these two points. But how is God’s justice then demonstrated in mercy and grace? Proverbs 17:15 says that “He who justifies the wicked and he who condemns the righteous are both alike an abomination to the LORD.” So, how can God justify the wicked, i.e., sinners and those who are not righteous, without Himself being an abomination?! This is the problem that Paul is actually dealing with in Romans 3:25-26. The solution of the problem is found in Christ being the propitiation. This means that God put forward Christ so that He would bring upon Him the punishment deserved for everyone who would believe. God did indeed justify the wicked, but His wrath against their sins was satisfied in the Substitute. He did not merely ignore their sins and justify them, that would have been an abomination. Rather, God punished their sins in the Substitute. God’s wrath was satisfied against their sins. God was propitiated. It is in this way that God is just and the justifier. God will do justice against all those who do not repent by sending them to hell to pay for their sins. But He is also the justifier of the ungodly because He has poured out His wrath, which He had against the elect, on His Son, the perfect and spotless Substitute. God’s desire in all of this to show that salvation only belongs to Him. It only comes through His efforts, not anything in humans. So that no one would have a basis to boast. God desired to show His righteousness and He indeed does show His righteousness. He is righteous in punishing the guilty and He is righteous in saving the elect because a Substitute paid their debt. God planned for salvation to be in this way, i.e., that it would be in Christ and by grace through faith so that no man could say that he contributed anything to his salvation. It is because of God that we are believers and we have been justified. The righteousness of Christ is credited to us and God sees us righteous and spotless in Christ. Why? So that we would boast only in the Lord. Justification is by grace and through faith so as to exclude boasting (Eph. 2:8-9). God is jealous for His glory and He will give it to no other. God had from all eternity determined to justify all the elect (Rom. 8:30 ). To do so, He likewise decreed that Christ in the fullness of time die for their sins, and rise again for their justification (Gal. 4:4; Rom. 4:25). What is important to notice is that it says that God did from all eternity decree and not actually justify the elect from all eternity. They are justified personally only when the Holy Spirit doth in time due actually apply Christ unto them (Titus 3:4-7 ). We are justified by faith and not election . Election ensures that we will be justified, but it is not the instrument of justification. It is God the Spirit who applies to us the work accomplished by the Son. It is He who convicts us of our sin (John 16:8). It is He who regenerates us (Ezek. 36:25-27; John 3:5-8; Titus 3:5) and thus gives us the new life in Christ. It is He who applies the words of Christ to us. Without Him, they're empty words but He makes them living and regenerates us (John 6:63). It is His person that we receive the moment we believe (Acts 2:38). The Spirit dwells in us (Rom. 8:9; John 3:16; 14:17; 2Tim. 1:14). We are sealed by the Spirit the moment we believe (Eph. 1:13-14). It is He who guides us into all truth (John 16:13). We are led by the Spirit (Rom 8:14; Gal 5:18). The Spirit sanctifies us (1Thess. 2:13; 1Pet. 1:2). The Spirit makes us more like Christ and transforms us (2Cor. 3:18). The Spirit prays with us and for us (Rom 8:26-27). The Spirit bears witness to us that we redeemed and are children of the living God (Rom 8:16). The Spirit works fruits in us (Gal. 5:22-23). The Spirit gives spiritual gifts to the body (1Cor. 12:4, 8-10; Heb. 2:4). The Spirit gives life to our mortal bodies (Rom. 8:11). The Spirit reveals the deep things of God to us (2Cor. 2:10). It is in the Spirit that we are spiritually baptized into the body of Christ (1Cor. 12:13). It is through the Spirit that we have access to the Father (Eph 2:18). There are much more things which the Spirit does for those whom Christ has purchased. Here we see the perfect work of the Triune God in the redemption of the elect. Christ obtained all that was necessary for the redemption of the elect 2000 years ago on the cross, yet the benefits which Christ has obtained are not directly applied, rather in God's timing, those who were before the foundation of the world in the Son chosen, are regenerated by the Spirit and changed from children of wrath into children of the living God. Not only at the moment of justification, but God doth continue to forgive the sins of those that are justified (1John 1:8-9) even if they can never fall from the state of justification (e.g. John 6:37-40; 10:28-29). It is not possible for a person who once was justified to later be unjustified. But through our sin we damage our relationship with God and with others. Because of that we may fall under God's fatherly displeasure and discipline (Heb. 12:3-17). We will remain in that condition until we grab a hold on the promise of 1 John 1:8-9, humble ourselves, confess our sins, beg pardon from the One Who has promised to forgive us, knowing that we will receive His forgiveness. Thereby we renew our faith and repentance and are again on the narrow path. We still sin. Once we are justified it does not mean that sin is completely eradicated. The penalty of sin is indeed completely eradicated, but the sinful world around is not eradicated neither is the flesh completely defeated yet. Our desires are not completely God-centered as they should be. We fall short. See chapter 9 on man's will in the State of Grace. We should daily pray for the forgiveness of the sins that we know about and others which we may not consciously know about. Our Lord taught us to pray “forgive us our debts, as we also have forgiven our debtors” (Matt. 6:12). We seek God's forgiveness as we see also seek forgiveness from those whom we have wronged. The Lord promises us that we will receive forgiveness if we come to Him through Christ and confess our sins. Oh, what comfort! What joy! What grace to a wretch like me! 1John 1:8-9 If we say we have no sin, we deceive ourselves, and the truth is not in us. 9 If we confess our sins, he is faithful and just to forgive us our sins and to cleanse us from all unrighteousness. If we think that we are able to live a sinless life and never sin again, we lie to ourselves and we are actually not in the Lord as we contradict His Word. But, when we sin we should confess our sins and not misuse grace (cf. Rom. 6:1-2). It is not like that God does not know that we sinned, but He desires that we come to Him, in all honesty, confessing our sins before His face and receiving forgiveness. It is not knowledge which God seeks, but confession and acknowledgment that we have rebelled against Him. John says that God is faithful and just in cleansing us from all sin and unrighteousness. He is faithful to His promise that we will be cleansed from sin and we will be glorified. But He is also just because the Substitute was punished in our place for all our sins, past, present and future. It is on this basis that God is just. Not because He ignores our sins, but because a propitiation–a satisfaction for those sins was provided in Jesus Christ for us (1John 2:1-2). Moreover, we know that we will be forgiven because it is Jesus Christ who intercedes for us and stands between us and His Father (Rom. 8:34; Heb. 4:15-16; 7:25). We don't stand before God on the basis of our righteousness, rather we are clothed in the perfect righteousness of Christ.